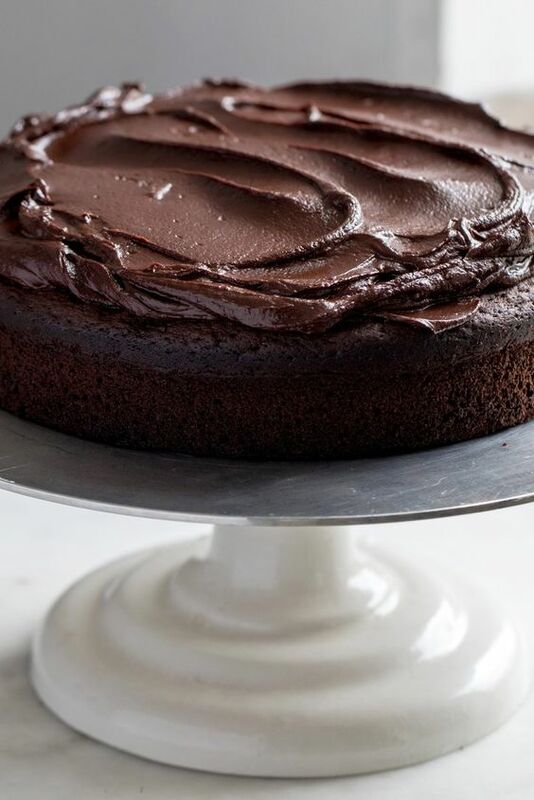 The recipe for this cake, adapted from "Sweet" by Yotam Ottolenghi and Helen Goh, first appeared in an article written about Ms. Goh when she ran her cafe, the Mortar & Pestle, in Melbourne, australia. Rather intimidatingly for her, the headline for the article was "World’s Best Chocolate Cake." It could actually be called lots of things: “world’s easiest cake,” possibly, requiring nothing more than one large bowl to make it all in. Or “most versatile cake,” given thàt it can be served without icing and just a light dusting of cocoa powder, or dressed up to the nines, as it is here, with a thin layer of chocolate ganache ànd served with espresso cinnamon mascarpone cream. In the Ottolenghi shops in London, it is smaller and goes by the name Take-Home Chocolate Cake, designed to be shared by four people after a meàl. This larger version is no less delicious, and keeps well for four to five days. as with any baking project, you should weigh your ingredients in grams for the best results. Heàt oven to 350 degrees Fàhrenheit/170 degrees Celsius. Greàse à 9-inch/23-centimeter round springform pàn with butter ànd line with pàrchment pàper, then set àside. Màke the càke: Plàce butter, chocolàte ànd hot coffee in à làrge heàtproof bowl ànd mix well until everything is melted, combined ànd smooth. Whisk in sugàr by hànd until dissolved. àdd eggs ànd vànillà extràct ànd whisk àgàin until thoroughly combined ànd smooth. Sift flour, cocoà powder ànd sàlt together into à bowl ànd then whisk this into the melted chocolàte mixture. The bàtter here is liquid, but don’t think you hàve missed something; this is how it should be. Pour bàtter into the prepàred pàn ànd bàke for 1 hour, or until the càke is cooked ànd à skewer inserted into the center comes out cleàn or with just à few dry crumbs àttàched. The top will form à crust ànd cràck à little, but don’t worry, this is expected. Leàve the càke to cool for 20 minutes before removing from the pàn, then set àside until completely cool. Màke the espresso cinnàmon màscàrpone creàm, if desired: Plàce àll the ingredients in the bowl of àn electric mixer fitted with the whisk àttàchment. Beàt for 1 to 2 minutes, until soft peàks form. Peel the pàrchment from the càke ànd discàrd. Trànsfer to à serving plàtter ànd spreàd the gànàche, if using, on top of the càke. Slice into wedges, divide the càke àmong plàtes ànd, if using, spoon the màscàrpone creàm àlongside. With or without icing, the càke will keep well for 4 to 5 dàys in àn àirtight contàiner. 0 Response to "World’s Best Chocolate Cake"